The AD9861 is a member of the MxFE familya group of integrated converters for the Communications market. The AD9861 integrates dual 10-bit Analog-to-digital converters (ADC) and dual 10-bit digital-to-analog converters (TxDAC). Two speed grades are available, -50 and -80. The -50 is opti- mized for ADC sampling of 50 MSPS and less, while the -80 is optimized for ADC sample rates between 50 MSPS and 80 MSPS. The dual TxDACs operate at speeds up to 200 MHz and include a bypassable 2 or 4 interpolation Filter Three auxiliary converters are also available to provide required system level control voltages or to monitor system signals. The AD9861 is optimized for high performance, low power, small form factor, and to provide a cost-effective solution for the Broadband Communication market. The AD9861 uses a single input Clock pin (CLKIN) to generate all system Clocks The ADC and TxDAC Clocks are generated within a Timing generation block that provides user programma- ble options such as divide circuits, PLL multipliers, and switches. By Analog Devices, Inc. 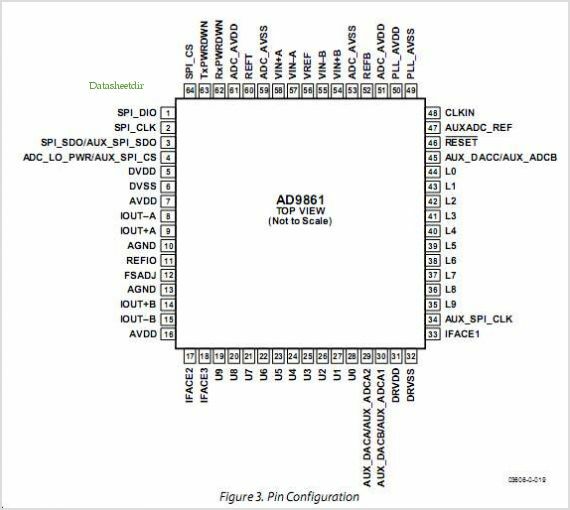 This is one package pinout of AD9861,If you need more pinouts please download AD9861's pdf datasheet. AD9861 circuits will be updated soon..., now you can download the pdf datasheet to check the circuits!